Summary of today’s show: Scot Landry and Fr. Mark O’Connell looked at some of the news this week, including the appointment of Fr. Mark’s good friend, Fr. Paul Soper, as interim director of pastoral planning for the Archdiocese; a special pro-life award for local attorney Philip Moran; and an all-day event for families at St. Anthony’s in Allston called Cat Chat. Also, Scot and Fr. Mark discussed the Sunday Gospel for this week. We lost power in our Braintree studio during the last segment of Friday’s show so we won’t have a podcast file or file to listen to the recording on our website right away. Thank you for your patience. 1st segment: Scot and Fr. Mark caught up on their weeks and discussed the fund drive for WQOM. They also discussed that Fr. Mark is interviewing candidates for two open positions in his office, including a canon lawyer and an operations assistant. Canon lawyers are a rare commodity. Scot said Fr. Paul Soper, who has been a guest on the show, has been named interim director of Pastoral Planning while he remains pastor of St. Albert the Great in Weymouth. Fr. Mark said it’s a difficult job to do full-time never mind part time. Scot said Fr. Jim Rafferty, who will be retiring as pastor at St. Paul in Hingham, will be in residence at St. Albert. The Pastoral Planning director job is very challenging. Fr. Mark said Fr. Paul attended Harvard University and graduated with a degree in astrophysics and continues to publish scientific papers and engage in computer data analysis. Scot said he will need to be able to crunch all that data in his role in assisting pastoral planning. He said also that Fr. David Couturier, OFM Cap., ends his service as Pastoral Planning director today, May 4. Break for fund drive banter. Make a gift to support Catholic radio in the Archdiocese of Boston on WQOM. 2nd segment: Scot said the Pro-Life Legal Defense Fund recently honored Salem lawyer Phil Moran with the Thomas More Award in recognition of his continued work to protect the unborn. Fr. Mark said this award is about people who courage and are unafraid to speak out in the public forum. Scot some people resist the Church’s teaching when they hear because it’s hard to hear when they’re living in the culture. He salutes Phil and all those who consistently promote the Church teaching. Fr. Mark said consistency is the right word because Phil Moran has done this year in and year out. The current president of the PLLDF Henry C. Luthin said Moran has “been in the trenches” for 40 years on the pro-life cause. “He has been a mentor and role model for me and for many other younger pro-life attorneys,” Luthin said. Moran said he plans to continue his work even as the pro-life position faces challenges in the public arena. “Have we in the pro-life movement been successful in the last 40 years? Not always, but during these forty years of frustration and anguish, we have been persistent. What we have done, much to the dismay of our opponents, is to keep the issue alive and we have done that,” Moran said. 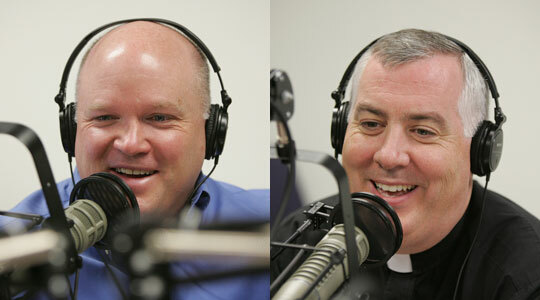 Rick and Scot discussed a one-day event at St. Anthony Parish in Allston on Saturday called Cat Chat. It’s a program for the whole family that’s designed like a one-day vacation Bible school. Scot said it’s important that we have a variety of programs for the whole family on the other days of the week outside of the Mass. Rick said it’s about helping children to own their own faith. They played a clip from an interview with Dalila Patrizzi that Rick had conducted. Scot noted that as followers we are tied to the one we follow. Fr. Mark said we can do nothing apart from the Lord. He also noted that if we want to bear fruit, we will be pruned. The Lord corrects and fashions us in his ways. Scot said we can’t take on excess baggage. We need to ask God to prune us, to help us to be all we are called to be in order to put all his gifts in service. Fr. Mark said we need to look at everything in our life that might be keeping us from God. Scot said the Holy Father said we sometimes need to fast from technology so we can have the space and silence to hear God’s Word for us. At this point we lost power in our studio and the station switched back to the fund drive out of the network in Buffalo.